By hungry runner on April 16th, 2012 . Filed under: Cupcake Ideas, Gifts . 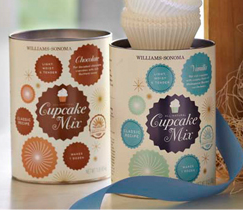 Williams-Sonoma now carries their own line of cupcakes mixes! The stores have a very fun display with all the mixes and jars of frosting. The Williams-Sonoma website now has a section called The Cupcake Shop where you will find the mixes, bakeware, and cookbooks. The mixes cost $14.95 and frosting, which is sold separately, is $19.95 per jar. The mixes are available in the following flavors: vanilla bean, chocolate, red velvet, coconut, and meyer lemon. The frosting is available in the same flavors with the exception of red velvet. I have enjoyed the Williams-Sonoma products I have tried in the past so I have high hopes for these mixes.